This Easter spoil someone with treats from Elizabeth Shaw. 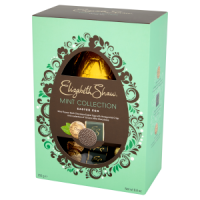 Elizabeth Shaw has a wonderful Mint Collection Easter Egg that includes a mint flavoured dark chocolate egg with honeycomb crisp and a selection of 12 dark mint chocolates. This Easter egg is the perfect gift for Easter and will be adored by mint lovers. It is available from Wilkinson’s and the RRP is £8.00. Elizabeth Shaw also has a wonderful collection of biscuits that are perfect for sharing this Easter. With a range of tempting flavours to choose from there is a biscuit for every taste. The flavours include Raisin and Hazelnut, Coconut and Hazelnut, Raisin and Cocoa and Mint and Cocoa. The Elizabeth Shaw Crisp Classic collections, Flutes, Twists and Creams also make delicious treats for Easter. To see the full range of treats visit www.elizabethshaw.co.uk.